CRA has completed a study for the National Recreation and Park Association (NRPA) regarding an examination of the economic impacts of operations and capital spending by the local park and recreation agencies on the US economy. In 2015, NRPA joined forces with the Center for Regional Analysis at George Mason University to estimate the impact of spending by local park and recreation agencies on the U.S. economy. Until then, there had been no national study to estimate the economic contribution of the thousands of local park and recreation agencies throughout the nation to the U.S. economy. NRPA and the Center for Regional Analysis joined forces again in 2018 to update the landmark 2015 study. Both the 2015 and 2018 studies focused exclusively on the direct, indirect and induced effects local park and recreation agencies’ spending has on economic activity, with analysis based on data from the U.S. Census Bureau. This report presents a summary of the key results from the updated study. 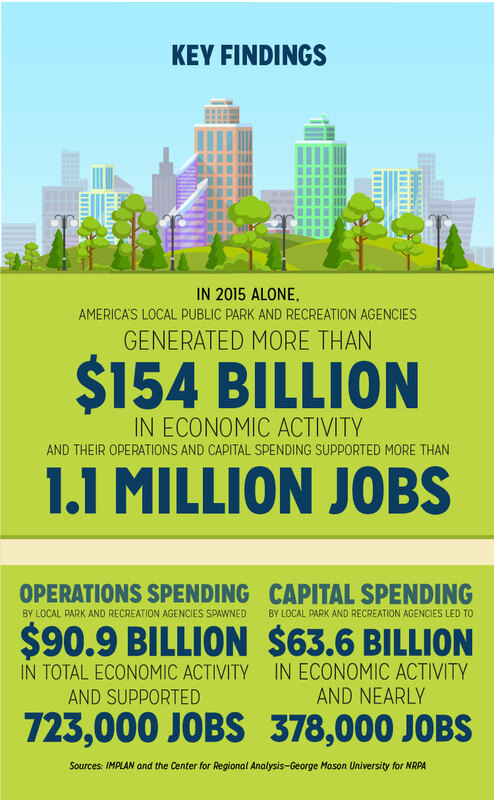 How Much Does Parks and Recreation Contribute to the U.S. Economy? 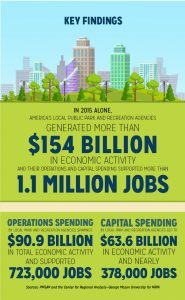 America’s local park and recreation agencies generated $154 billion in economic activity in 2015, nearly $81 billion in value added and more than 1.1 million jobs that boosted labor income by $55 billion. More specifically, operations spending by local park and recreation agencies generated nearly $91 billion in total economic activity during 2015. That activity boosted real gross domestic product (GDP) by $49 billion and supported more than 732,000 jobs that accounted for nearly $34 billion in salaries, wages and benefits across the nation. Further, local park and recreation agencies also invested an estimated $23 billion on capital programs in 2015. The capital spending led to an additional $64 billion in economic activity, a contribution of $32 billion to GDP, $21 billion in labor-related income and nearly 378,000 jobs. These are the key findings from research conducted by NRPA and the Center for Regional Analysis at George Mason University for the Economic Impact of Local Parks Report. Policymakers and elected officials at all levels of government should take notice. Investments made to local and regional parks not only raise the standard of living in our neighborhoods, towns and cities, but they also spark activity that can ripple throughout the economy.